Please feel free to join Jasons brand new personal website on thejasonpayne dot com! Learn more about Jason, his featured projects and bands beside Nitzer Ebb. Douglas and Terence are back on stage as Fixmer/McCarthy. The guys will be on stage at Berlin Berghain on Thursday, May 24th, 2012. On planned tracklist are some older classics from Between The Devil and Into The Night such as some new and unreleased tracks. The Line Up will be rounding off by Norman Nodge (Resident DJ Berghain), DJ Hell (Gigolo) and Karl O’Connor (Downwards). Happy New Year Ebbheads! Ten years ago this website went online and thus the year 2012 is the year of the 10th anniversary of Nitzer Ebb Internet Presence! Welcome again and Join Us In Our Playground! 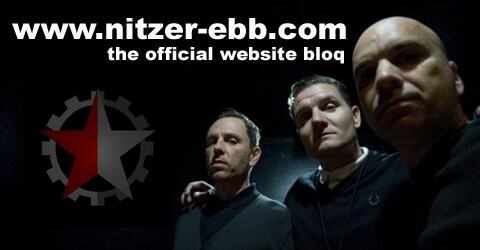 Nitzer-Ebb dot com wishes all fans, friends and supporters a merry christmas and a happy new year! May the Holiday Season bring only happiness and joy to you and your loved ones. Ted was my dad, he was a loving husband, father , brother, son and grandfather who, after fighting asbestosis for nearly 20 years, he succumb to an asbestos-related lung cancer which eventually killed him on October 5th, 2011. I and my family wish to donate any money spent on flowers, cards or any other kind tokens of condolences to help support the wonderful work done by the Hospice at Home team and others based at St. Elizabeth’s Hospice, Suffolk, England.